Storage is a vital component of any commercial or industrial business, allowing for detailed archiving of paperwork or equipment while keeping working areas free of clutter. Here at Stodec, we are a Dexion-approved storage centre, allowing us to provide a full range of industry leading products at competitive rates. Our selection includes MOVO pallet racking, mobiles, office mobiles, carousels, pallet glidestock and much more. 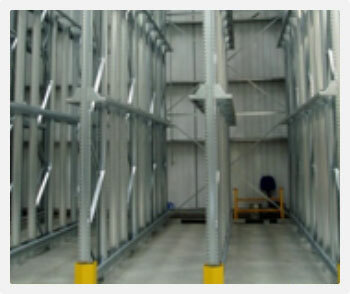 Stodec’s expert team have over 30 years of experience in this industry, and are on hand to carry out free site visits to determine the specific storage needs of your business. With this information, we can then draw up a detailed design of your storage system, from commercial or industrial shelving to pallet and cantilever racking , before providing full delivery and installation of all of your storage components. After the acquisition of specialist Bakers Giles Foods by Warburtons, Stodec were asked to survey the existing dry warehouse to maximise pallet storage and create floor space and a safe and efficient working environment. After working closely with the client, Stodec supplied and installed Dexion P90 Silverline pallet racking within budget and on time. We increased pallet storage from 30 pallets to 236 pallets stored.